Being physically active is great for both your physical and mental health. When you exercise, your brain releases chemicals called endorphins which boost your mood. It is a great way to release and manage your stress. The college fitness room is available to students and the SU has sports and societies that you can get involved in to increase your physical activity. Choose a variety of physical activities you enjoy. Try different activities until you find the ones that feel right for you. Get into a routine — go to the pool, hit the gym, join a spin class or set a regular run and do some planned exercise. Make it social by getting someone to join you. Limit the time you spend watching TV or sitting in front of a computer during leisure time. Move yourself — use active transportation to get places. Whenever you can, walk, bike, or run instead of taking the car. Spread your sessions of moderate to vigorous aerobic activity throughout the week. 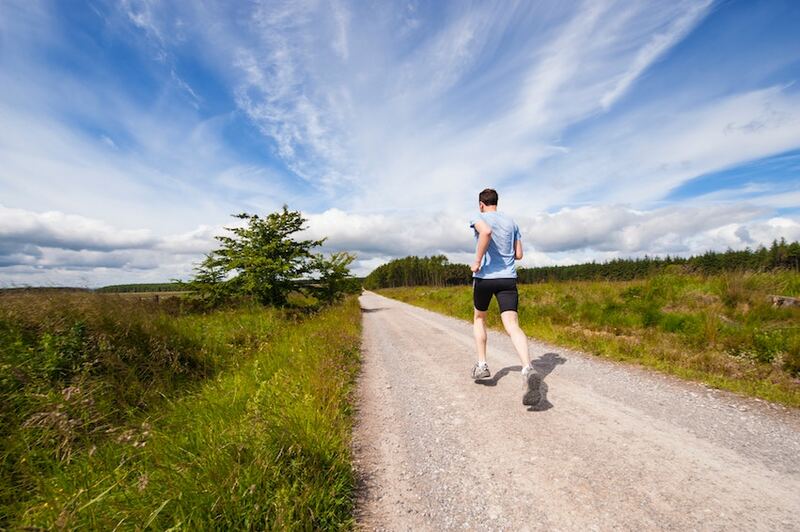 Do at least 10 minutes of physical activity at a time. Join a team — take part in sports and recreation activities in groups. You’ll make new friends and get active at the same time. Eating well is important for us to feel good, look healthy and maintain a healthy weight. Long-term ir can reduce our risk of illness such has heart disease, diabetes and osteoporosis. The Department of Health has developed a new Healthy Food for Life – the Healthy Eating Guidelines and Food Pyramid in partnership with other experts in nutrition in Ireland to help us make good choices to eat a balanced diet. 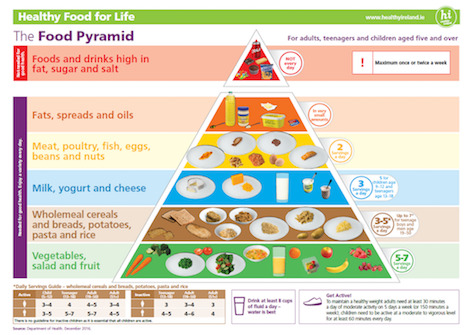 Download this Food Pyramid leaflet from Healthy Ireland to read more. The #LittleThings Campaign provided some greats information and tips about the importance of sleep to our mental and physical health. Not getting enough sleep can make it difficult to complete even the simplest daily tasks and can make life in general feel like a much greater challenge. 8 hours sleep make the other 16 easier. Learning to engage in sleep hygiene can help us to clean up our sleeping act. Keep active - Get regular exercise but try to avoid exercise in the hour before bed time. Avoid stimulants - Avoid tea and coffee, or foods high in sugar, in the evenings. Wind down - Have a bedtime routine and wind down time before going to bed. Turn off all technology and do something restful such as gentle stretches or taking a warm bath. Routine - Go to bed and get up at the same time each day. No naps - If possible, avoid naps during the day. Get comfy - Your bedroom should be a comfortable temperature. If it is too hot or too cold, it may make it more difficult for you to sleep. Find a good book - Reading in bed can focus your mind and empty it of the day’s worries. Relax - Try to relax with deep breathing exercises when in bed. The smell of lavender oil also helps with relaxation – try sprinkling a few drops on your pillow. Alcohol can be enjoyed in moderation but drinking too much can have a negative effect on your mental health. Ask About Alcohol provides information, tips and support to help you cut down and improve your mental and physical health. For information, advice and support on alcohol visit askaboutalcohol.ie. For information, advice and support on drugs visit drugs.ie. If you are thinking about quitting smoking for good, a little bit of support and planning will give you a better chance of giving up for good. QUIT.ie provide lots of help, advice and support to help you achieve this goal.